Located on a small community on the residential urbanisation of Huerta Nueva, this well proportioned and maintained penthouse boasts views of the andalucian countryside and the local mountain range Sierra Cabrera. With a build size of 83.19m², this welcoming first floor property consists of an open plan lounge / dining room with a fully fitted gallery style kitchen on the left side; a hallway leading to a family bathroom with shower, toilet and basin, the master bedroom that benefits from a private terrace with views of the well kept communal gardens, fitted wardrobes, ceiling fan and en-suite with shower, toilet and basin, and a double bedroom with fitted wardrobes, ceiling fan and a Juliet balcony also benefitting from views of the green communal gardens. The property although being an apartment, also benefits from an internal staircase that leads you up a floor to a third occasional bedroom or office room and a large south facing solarium that wraps around the side of the property. From the solarium there are excellent views of the Sierra Cabera, Mojacar pueblo and the local Los Gallardos countryside. With the addition of a pergola and a few potted plants this could make an excellent cocktail terrace for those long summer evenings. However, if you prefer to relax inside during the summer months the property is well equipped with air conditioning throughout, to keep the interior of the property cool providing a haven from the heat. Occasionally this part of the world does get a little colder though, and during the winter if the property doesn’t offer as much heat as you’d like, this penthouse has the added benefit of having electric heaters installed. The property has contracted wifi and internet connection, which can be transferred over to the new owner if desired. As you can see, this property comes with many extras, including the use of the fabulous communal swimming pool, communal gardens, and also an assigned parking space. Running costs are relatively low making it a very affordable lock-up-and-leave holiday home as it has been for the current owners or it would be equally suitable as a full time residence. 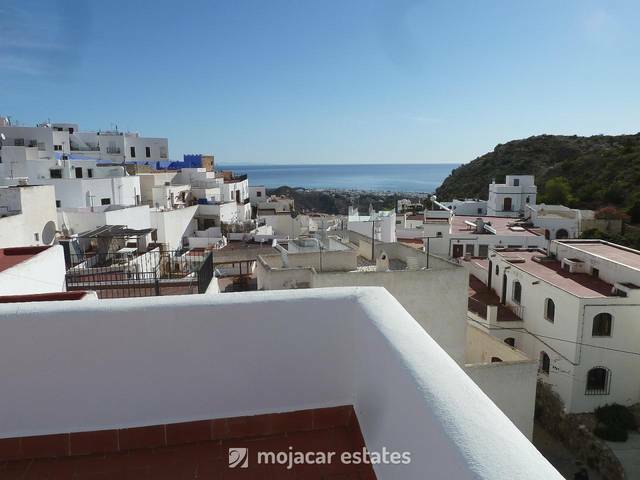 The beaches of Mojácar, Garrucha and Vera are only 15 minutes drive away and the local village of Los Gallardos 2 minutes. Los Gallardos has a variety of bars and restaurants providing both traditional Spanish fare and English dishes too. With two small supermarkets and the weekly street market offering a large selection of fresh fruit and vegetables that’s the food shopping taken care of too. The A7/E15 is close by making travelling times to Almería, Murcia and Alicante airports 45, 80 and 120 minutes respectively. Golfers have a varied selection of courses to choose from in the area including Marina Playa on the coast, the Arizona style course at Desert Springs and the Valle del Este with 4* Hotel & Spa just a few kilometres away.